Lachesis is a genus of venomous pit vipers. Bushmasters are the longest type of viper in the world. There are 4 species of Lachesis; L. muta (pictured), L. melanocephala, L. acrochorda and L. stenophrys. Bushmasters are sexually dimorphic in size, with males reaching larger sizes than females. They have a thick cylindrical and tapered body, with a triangularly shaped head and narrow neck. 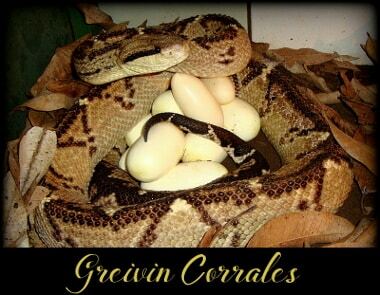 Regarding their reproduction, they are the only vipers in the New World that lay eggs instead of giving live birth. Maintaining bushmasters in captivity poses a significant challenge because they are very susceptible to stress, may refuse to feed, and can suffer from maladaptation syndrome. Simulating their natural environment, absent the stress that arrives with human interactions in the form of keepers, is hard to accomplish, but their reproduction depends on the conditions in which these animals are housed to be optimal and free from stress. The terrarium has to be big enough to keep the largest viperid of the world. Recommended size enclosure 3 meters long, 1.5 meters high and 1.5 meters wide (9.8 x 5 x 5 feet). Several logs and rocks were provided to facilitate ecdysis. Even though is not about how big is the enclosure, but what do you put inside. Remember we are working with a highly venomous snake, so safety will always come first. 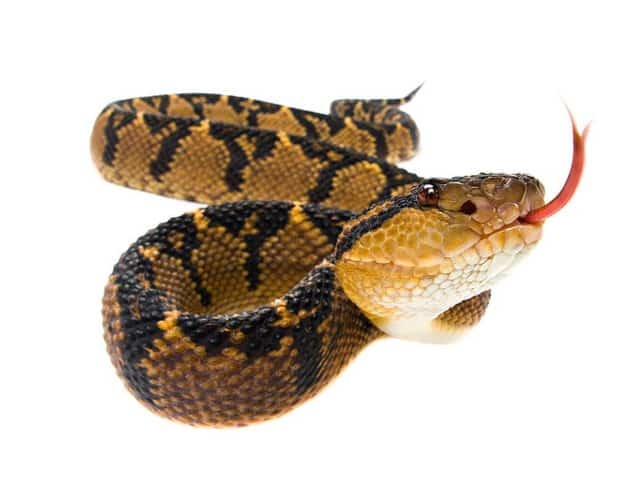 Respect these creatures; they are very smart and unpredictable, which means if you will work whit Bushmasters, you MUST have the antivenom at hand. This is one of the most important aspects in keeping bushmasters in captivity. You can build it out of wood, 0.75 meters wide, 0.75 meters long, 0.25 meters high (2.5 x 2.5 x 0.8 feet), with an entrance diameter of 20 cm, simulating a natural mammal burrow entrance, with the chamber inside. Is important to keep the shelter inside always dry. Different layers compose the substrate; A bottom layer of gravel allowed for drainage. Above the gravel was a thin layer of substrate and moss to help maintain the humidity in the terrarium; this layer was then covered by dry leaves to help with nesting. The gravel substrate provided a barrier to the moist underlying soil of the ground that may promote fungi, parasites and ventral skin infections in the snakes, besides the ventilation in the enclosure will help to avoid fungi as well, but not too much in order to not losing the humidity inside. Several methods can be used in order to provide a gradient temperature: a 40 W light bulb turned on during five hours per day in the morning, which is located at a corner of the terrarium; and a heat-pad, which is turned on 24 hours per day, located at the opposite corner in the terrarium with a stable temperature of 25 °C (77 °F). These conditions provide an overall range of temperature of 20-26 °C (68-79 °F). Water is supplied ad libitum, and the keeper must change it minimum twice per week. Better close to the burrow entrance, due that bushmasters in nature always come out of the burrow with the rains looking for rainwater. The relative humidity has to go from 75% to 90% and depends on availability of water inside the terrarium and frequency of misting, as well as the environmental fluctuations and rain precipitation intervals. The humidity must be balanced, so is not to low causing dehydration in the snake or too high leading to lung infection. The feeding process is voluntary by the snake, never apply forced-feeding techniques, which translates in low stress to the animals. An important feature seen in the wild is that this species tend to feed on small preys, which makes them a selective predator. In fact, smaller prey helps to avoid obesity and keep snakes in an active state whilst larger prey increase the lapse time of digestion and the snakes become less active. Furthermore, the feeding is performed with rats; adult animals are fed every 10 days with 180-220 g rats approximately. The snakes were can be fed once per week post mating season as well as after breeding in order to gain weight. Always try feeding dead, and if the rat was frozen you have to take it to a natural body temperature in order to help the bushmaster identify and strike the prey. When cleaning the enclosure, used long hooks to handle the snake, but always be careful with the first third of the body, if the animal drops it can die. What I like to do is tailing the snake and with the other hand I used a long snake hook. A tong is always useful to grab stuff inside, but never the snake. Never take your hands inside to the terrarium, the strike in this pit vipers is reach long distances and very fast. Spot clean cage whenever is necessary. I do entire cage cleanings 2x per year or if I have a mite issue or if I will move snakes to new enclosure. New bedding, bleached enclosures. I feel that more than that is undue stress on a animal. Dysecdysis is due to low humidity and can lead to dead to the bushmaster. The relative humidity in the enclosure has to go from 75– 95%, all of which simulates the natural habitat of this species. Increasing the humidity in the enclosure by misting some days prior to shed is helpful, if the snake does it in one piece is perfect, if not, try to help removing the pieces left in the animal. The shedding process is a strategic technique to stimulate the male for mating. Various factors may be affecting successful captive management in Lachesis species including stress, poor body condition (i.e., dehydration, emaciation), parasitism, and inappropriate housing, humidity levels and substrates. It is important to mention that the courtship of males can be very aggressive, in which the male dominates the female with rough movements, touching its scales against those of the female, surrounding the female’s vent with its prehensile tail, moving its tail up and down, and rubbing all its body on her, if the female is younger than 4 years old, or small, it can die by the stress caused by the male.